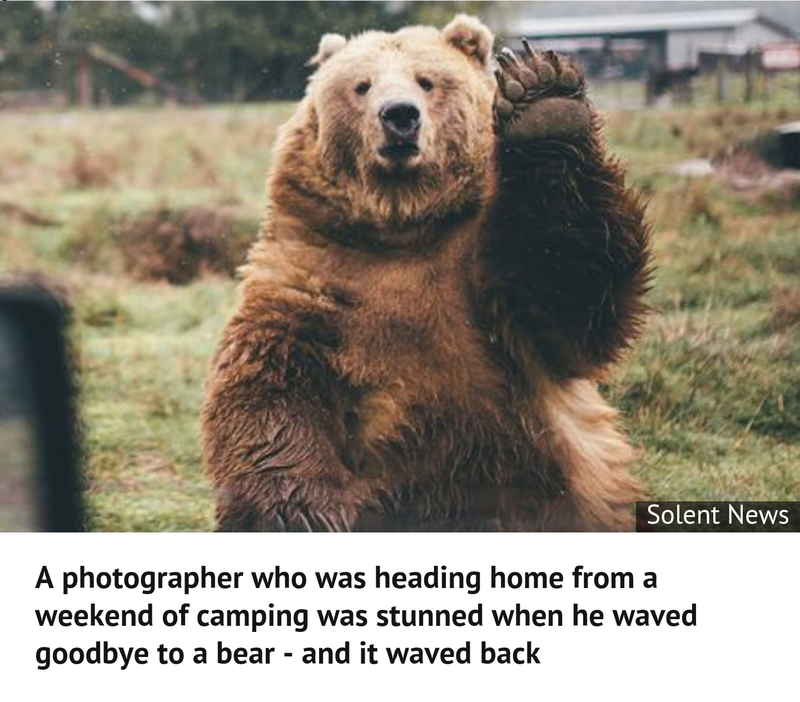 As you can see in the caption this is a picture of a bear who waved back to a camper after he waved to the bear on his way out of the campground. What can we get from this article? Bears can do cute things? Sure. Perhaps they can understand basic human communication? Maybe. Here is what I got out of this picture and article. The bear in question is a Kodiak brown bear from Washington. I don’t know him personally, but they are reputed to be one of bears with the worst temperaments. In this picture however the bear looks quite friendly. In fact, he is acting quite friendly. By waving, or showing paw, he is showing bears can be rather friendly. Now I am not telling you to go up to a bear in the wild and start waving to see what happens. Some bears are not as friendly as this one. The same can be said for people. Still when we wave we become like this bear, friendly and approachable. So as you drive and even walk down the street share your smile or maybe even a wave. It will astound most, please some and confuse the rest. Either way you will be doing your part to make this world a far more enjoyable place. Feel free to even print out the picture of this bear to remind you to wave and be friendly and approachable. Also feel free to share this post with everyone you know. The more people we get smiling and waving the friendlier the world will become for us all.